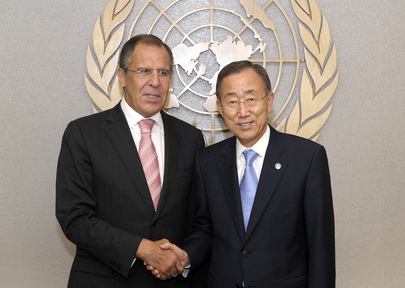 UNITED NATIONS, October 7 -- Russian Foreign Minister Sergei Lavrov was blocked inside the Hotel Intercontinental and then his US-provided security detail "disappeared," Russia complained on Friday in the UN's Committee on Relations with the Host Country. The meeting was closed but sources inside tell Inner City Press that the US representative's response was that this was the first the US heard of it, and that a response would be provided. Any response provided to Inner City Press will be published on this site. The US was already aware of the other "Any Other Business" complain, concerning the total freezing of First Avenue for half an hour on September 21. This blocked access to the UN for many "VIP" delegates. The US explained that the blockage was no only for President Obama, but also Iran's Ahmadinejad, whose entry was delayed thus leading to a "double blockage." The US said it would try to avoid this in future years. The annual UN General Debate usually gives rise to complaints, but the incident of the year was the dust up between the "huge" entourage of Turkey's prime minister Erdogan and UN Security. The incident left at least three UN Security officers injured and taken to the hospital. But UN Secretary General Ban Ki-moon ran and apologized to Erdogan, leading to continuing "bad blood" with UN Security and staff, multiple sources daily tell Inner City Press. This was not viewed as a Host Country -- that is, US -- issue, but one meeting attendee afterward asked Inner City Press, how did that large a delegation get into the UN? Watch this site.